"If you're curious what Mixview looks like, but haven't yet installed the Zune Software, check this out: you can now preview mixview while you're connected to the web, via zune.net. 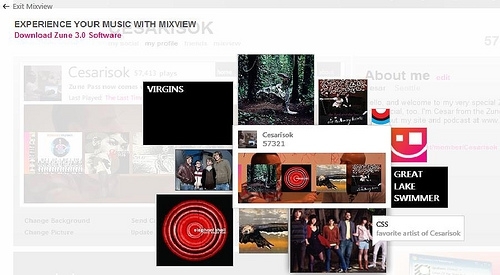 Now when you click on the page for an album, artist, or Zune Card, you can click the link "mixview" to check it out. If you're already running the Zune software, this is a great way to give your friends a chance to check Zune out!" Well this is certainly cool; a nice way to show off the Mixview feature to friends or people without the 3.0 software. The web version provides similar functionality as its desktop counterpart, and is a neat way to visualize the relationships between your favorite artists. It runs on Microsoft's Silverlight web framework, which calls to mind an issue I have with the Zune Cards themselves. Namely, that they're still running on Flash, Silverlight's competitor. Lately I've been attempting to port the ZuneCard data to Silverlight, and hopefully I'll have a working prototype up and running shortly. But in the meantime, you can amaze your friends and humble your enemies with this cool web-based music service. Check it out on Zune.net.